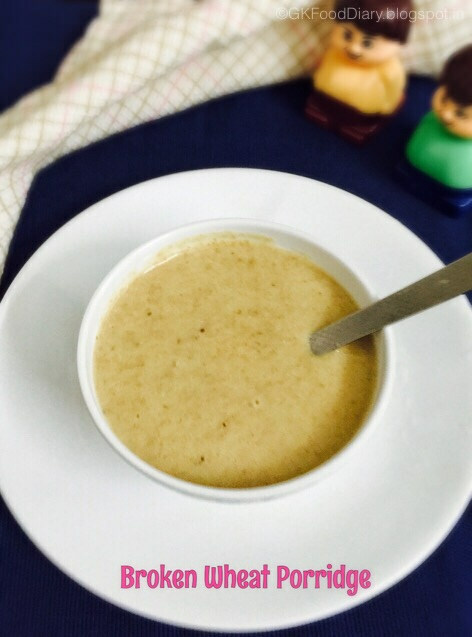 Healthy broken wheat porridge for babies with jaggery, dates, almonds and cows milk. Boil cows milk (if using) in a saucepan and keeps it ready. Soak almonds in water for at least 2 to 3 hours. After 3 hours, peel the skin of almonds and set aside. De-seed the dates and keep it ready. Take 2 tbsp of broken wheat in a pressure cooker along with de-seeded dates, peeled almonds. Add ¾ cup of water and close the lid of the pressure cooker. Pressure cook it for three whistles and open the cooker once the pressure released. Add ¼ cup of water to the powdered jaggery and boil in a separate vessel until it melts completely. Then filter out the jaggery water using a strainer. Set aside. Now take the pressure cooked broken wheat, dates and almonds in a blender along with filtered jaggery water. Blend them until smooth. Transfer the blended broken wheat into a saucepan and switch on the flame. Add ½ cup of milk (Skip adding milk if you are preparing this porridge for a baby under one year ) to the saucepan and mix everything slowly with a whisk. Boil the porridge in low, medium flame. Stir it continuously while cooking otherwise porridge may stick to the vessel. Boil the porridge until it becomes thick. Remove from the flame once done and cool it down. The porridge becomes thick after cooling down. So switch off the flame accordingly.